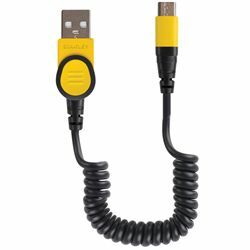 The STANLEY Coiled Micro-USB Charge and Sync Cable works with both phones and tablets. It is designed with reinforced strain relief at the connector and extends up to 3 ft when you need it. REINFORCED STRAIN RELIEF - Each connector has an extended, flexible casing that bends and flexes to prevent wear and tear at the connection point. wear and tear at the connection point. NO MORE TANGLES - The coiled cable never tangles and expands up to 3 feet to accommodate the length you need. MADE FOR ANDROID DEVICES - Now you can connect a variety of USB devices to many Android phones and devices as well as GPS units, wireless headsets and e-book readers.